A KIT sponsorship deal for newly formed cycling club, Carse of Gowrie Velo, is set to have a peleton of keen road cyclists, setting off on the right track with smiles on their faces. A joint three-year sponsorship deal agreed between Tayside solicitors firm, Miller Hendry, and specialist financial planning firm, Medical & Dental Financial Planners, will see the club, which meets weekly at Inchture every Thursday evening, line up at major cycling events looking their very best. Cycling in Scotland has seen a dramatic increase in popularity in recent years, propelled by Olympic success over the past ten years and Bradley Wiggins and Team Sky’s historic success at the Tour de France in 2012. 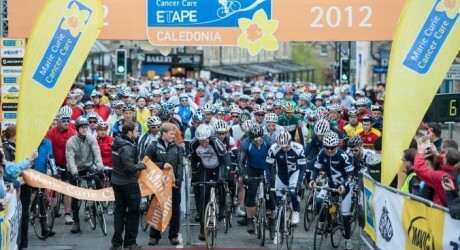 More locally, events like the Marie Curie Cancer Care Etape Caledonia in Pitlochry, have led the way in establishing a strong demand for cycling clubs and enhanced training facilities for keen cyclists. In line with this surge in demand, the numbers attending COG’s Thursday night rides have dramatically increased in recent months and the decision was taken in November last year to become a formal club affiliated to Scottish Cycling. Carse of Gowrie Velo’s aim is to be a sociable and approachable club that contributes to the local cycling calendar and cycling development initiatives. Their first major event, where the new kits will be revealed in public, will be this year’s Marie Curie Cancer Care Etape Caledonia, an 81-mile course through the magnificent scenery of Highland Perthshire. COG Velo has over 20 entrants for the event in May this year and many will be aiming to complete the course in under four hours. Alistair Duncan, head of Miller Hendry’s Commercial Department, a keen cyclist who will be participating in that first event, said: “Miller Hendry is a progressive firm and very keen to support local initiatives. “Our three year sponsorship of Tayside’s newly formed cycling club is a measure of our commitment to the area in which we are based. We’re small enough to care and big enough to make a difference. David Henderson, of Medical & Dental Financial Planners, also commented: “I’m delighted to be co-sponsoring the kit for Carse of Gowrie Velo and look forward to seeing the team at the Marie Curie Cancer Care Etape Caledonia event later this year.